This is the first game in the Darkstalkers series. For other games in the series see the Darkstalkers category. Darkstalkers, known in Japan and Asia as Vampire, is an arcade game developed by Capcom in 1994 on the CPS-2 hardware. It is the first in a series of games that are notable for its cast of characters based on well-known fictional monsters (hence its Japanese title, Vampire) and introduced many of the concepts used in later Capcom fighting games, including the use of sixteen color animation sprites later employed in the Street Fighter Alpha and the Marvel vs. Capcom series. There have been five arcade games in the series with a few console ports produced as well. After having developed Super Street Fighter II Turbo, Capcom had felt that the Street Fighter II series had run its course and it was time to invest in new ideas and designs. The Darkstalkers concept was a bold move for Capcom, as all of the characters were entirely new and, other than the legends that they were based on, completely unknown personalities. The other direction that Capcom was moving in at this time was the X-Men: Children of the Atom game which, by contrast, featured a completely well known cast. 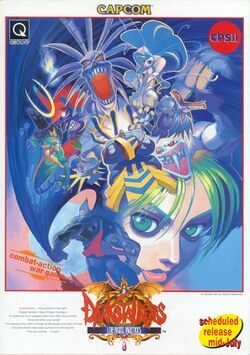 The first in the series, fully titled Darkstalkers: The Night Warriors features ten playable characters, and two non-playable boss characters. The game features the same gameplay system Capcom developed for the Street Fighter II series, but with several new gameplay features such as Air Blocking, Crouch Walking and Chain Combos. The game featured a Special meter similar to the Super Combo in Super Street Fighter II Turbo, which the player could fill up to perform a super powered special attack. Unlike the Super Combo meter in Super Turbo, the Special meter in Darkstalkers gradually drains until the player performs their super move, preventing players from preserving their super moves for later use. This game was ported to the PlayStation in 1996. This page was last edited on 13 April 2016, at 15:32. This page has been accessed 81,007 times.